Pastitsio is a baked pasta dish enjoyed in Greece and throughout the Mediterranean and Middle East. 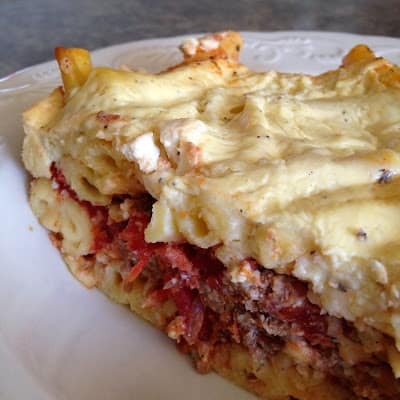 Pastitsio is the Greek version of Comfort Food. This dish is versatile and many different versions exist. 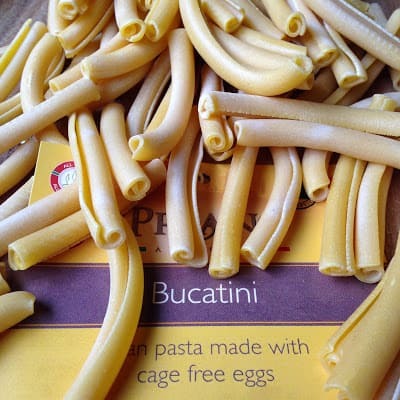 The typical Greek version consists of a thick, tube-like pasta such as: bucatini, penne or any other type of a short, thick, tube-shaped pasta. 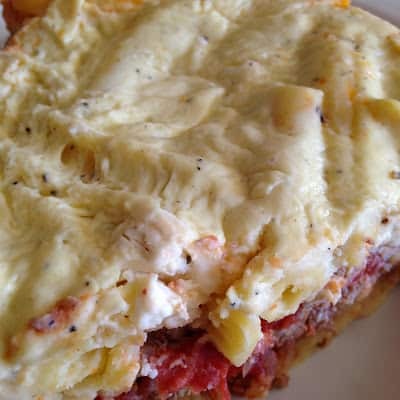 Pastitsio is similar to the Italian dish, Lasagna. 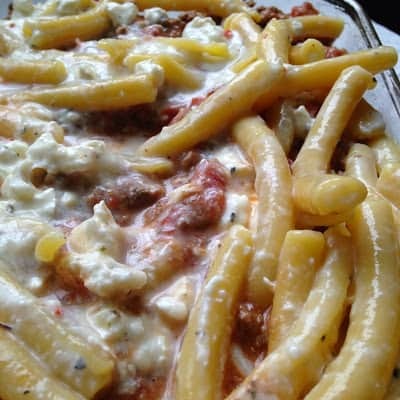 The pasta is baked with two sauces: a red meat sauce made with tomatoes and spices and a creamy white sauce such as a bechamel sauce. Ingredients are layered together in a baking dish and baked in the oven. 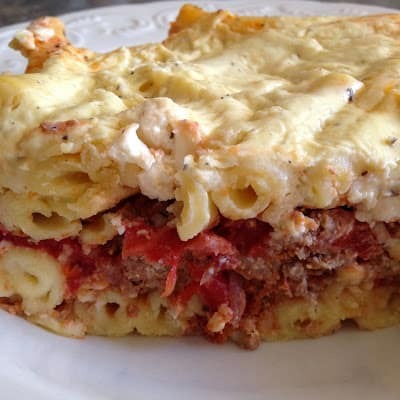 The word “pastitsio” is a Greek variation on the Italian word “pasticcio” meaning a hodgepodge of different ingredients baked together in a single dish. 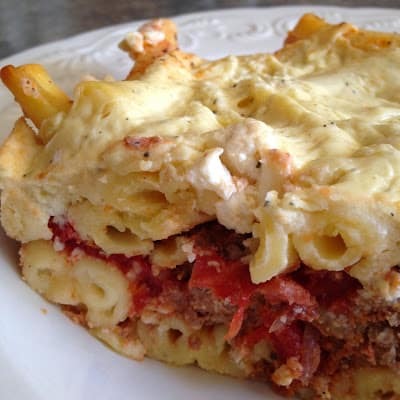 Even within Greece, many versions of pastitsio exist. 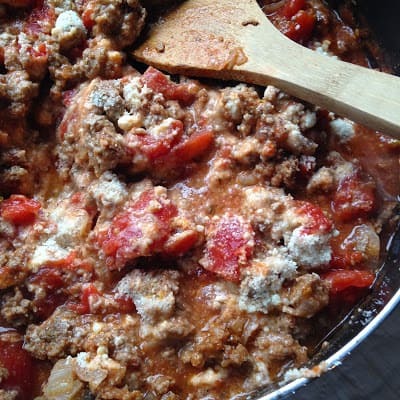 Some recipes include ground lamb in the red/meat sauce, while some use ground beef. Cinnamon, allspice and/or nutmeg are commonly added to the meat sauce. 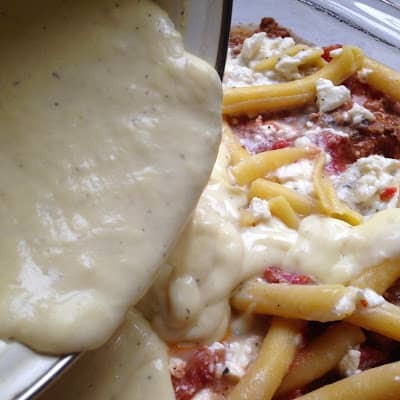 The white sauce used to top the pastitsio, is often a bechamel sauce. It can also be topped with a classic white sauce made with milk and a light colored roux. Some recipes call for a mornay sauce, a variation on the bechamel sauce that includes grated cheese. Either sauce will add to the flavor of Greek Pasitisio making it one of the reasons why it is a favorite throughout the country and surrounding areas. Comfort food at it’s best. Famous herbs of great quality are easy to find in Greece. Chamomile, sage, basil, mint, parsley, rosemary and oregano to name just a few. Ouzo is the most famous Greek alcohol beverage, the trademark of the country. It is a strong alcohol drink, drinkable straight with ice or with a bit of water. Ouzo happens to be my personal favorite:) The best ouzo is made in Lesvos and the famous trades are Ouzo Plomariou and Barbayanni. Serve with a green salad and a loaf of rustic bread. Wine Suggestion~ Skouras Saint George Agiorgitiko 2015. Winemaker Notes: The color is a bright, deep morello cherry-red. The nose reveals aromas of blackberries, raspberries and ripe strawberries with just a touch of aniseed and spices such as clove and cinnamon. A medium-bodied red wine, with a finish dominated by red fruits followed by sweet vanilla and black pepper. Cook pasta according to package directions. Drain, rinse and drain again. In a small bowl, lightly beat the yolks. Set aside for white sauce. 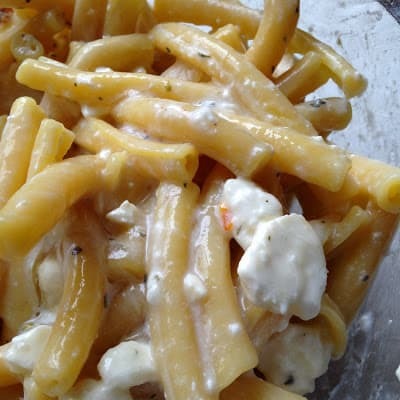 Stir egg whites, feta cheese and 1/4 cup milk into the pasta. Set aside. Layer half of the pasta mixture in a lightly greased 8 x 8 x 2 baking dish. Top with meat sauce and then with the remaining pasta mixture. Prepare the white sauce. In a medium saucepan, whisk together 1 1/2 cups milk, flour, salt and pepper. Cook over moderate heat, whisking constantly for 8 minutes or until mixture is thickened and bubbly. Slowly stir about 1 cup of the hot mixture into the lightly beaten egg yolks, then return this mixture to the saucepan. Cook stirring constantly, for 3 minutes or until mixture thickens. (Do not boil) Stir in the 1/4 cup Parmesan cheese. Pour the sauce over the pasta layer. I've only had pastitsio in a restaurant. So good! 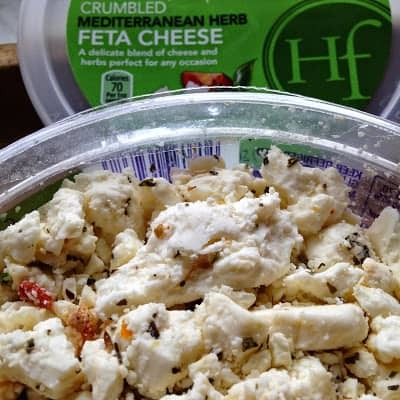 Will have to try this–Greek food is something we all enjoy at my house!